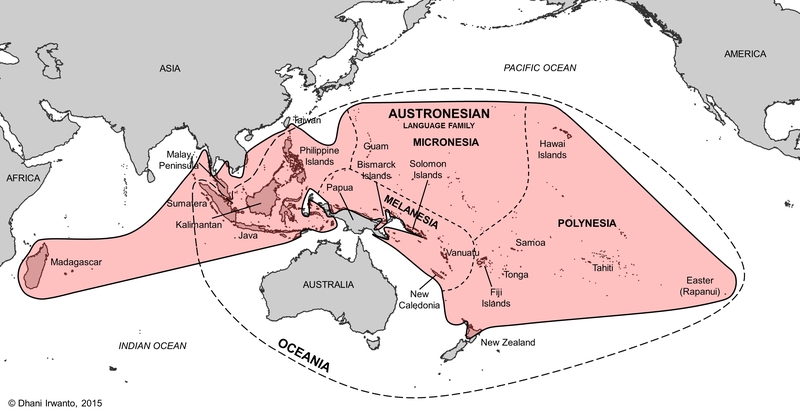 The Austronesian language family encompasses over 2,000 languages, including those of Taiwan's indigenous peoples, as well as the languages of the Micronesian, Melanesian, and Polynesian peoples of the Pacific, several languages of Southeast Asia, and a geographic outlier in Madagascar. The island of Taiwan is widely considered the origin point for the difussion of the Austronesian languages (although this has been challenged). Taiwan's indigenous peoples have inhabited the island for at least 5,500 years, gradually becoming a minority as Han Chinese migration began in the 17th century. The various indigenous groups currently number some 530,000 people, or 2.3% of the island's population. While these indigenous groups suffer discrimination and lower economic status, there has recently been movement within Taiwan toward greater recognition of their place in the society. Establishment of the cabinet-level Council of Indigenous Peoples in 2002 sought both improvement of the quality of life for Taiwan's indigenous communities as well strengthening relations between Taiwan’s indigenous groups and those in other countries. See our last post on Taiwan's indigenous peoples.